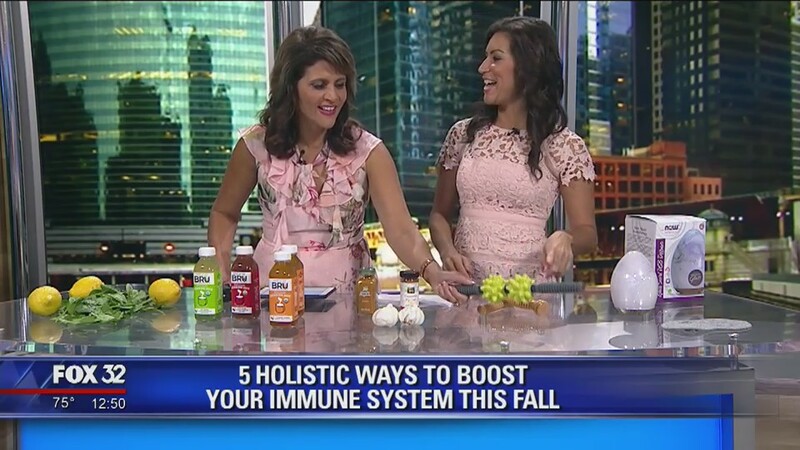 Women’s Weight Loss Coach and Fitness Expert Stephanie Mansour was featured on Fox 32 in Chicago to discuss holistic remedies for the upcoming cold and flu season. These are five simple things you can easily add into your existing daily routine to keep your health at a maximum. I don’t know about you, but it seems to me that every time colder weather rolls around, people start falling sick with the same bug. Whether you opt to get the flu shot or not, these natural remedies can help you fight inflammation in your body and they come with zero health risks. Let’s start bright and early. Are you an avid coffee or tea drinker in the morning? You don’t have to ditch your beverage of choice, but try getting in the habit of having a cup of hot water and lemon first thing in the morning. You can boil the water in the microwave if you’re short on time. Squeeze the juice from half a lemon in there, sip, and you’re good to go! The reason is twofold; lemon is very detoxifying and it’s going to help reduce inflammation. Or, maybe you’re more of a morning smoothie drinker. If that’s the case, try adding one to two cups spinach to get the same anti-inflammatory benefits plus that boost of Vitamin C.
Do you find yourself reaching for more coffee in the afternoons to keep yourself going? Let me introduce you to a better option, Bru Broth. Bru Broth is the freshest bone broth on the market and contains just the right amount of protein to wake you up out of that afternoon slump! It’s loaded with collagen which is great for your skin, and it’s amazing for your overall gut health. They come in easy-to-pack, portable bottles, are available in a variety of fun flavors, and they’re 100% organic! Win, win, win! They also sell a line called RESET for anyone interested in doing a bone broth cleanse. Unlike most juice cleanses that can be pretty high in sugars, the Bru Broth cleanse boasts less than one gram of sugar per serving. Dinner is the perfect time to play up the spices. Depending on your spice tolerance consider adding one of the following to your nightly stir-fry or soup: turmeric, ginger, garlic, or even some cayenne pepper. What we’re looking for here is just enough spice to speed up your metabolism and keep that digestive system running smoothly. Gut health is essential, especially when trying to fight off or avoid the flu. Wrong. Like I always tell my private weight loss clients, it is absolutely okay to stop your workouts if you feel yourself getting sick. If your body is aching, kick back and treat yourself to some self-massage. You can use a foot roller, or roll out on a foam roller if you have one handy. Go easy on yourself. Right after fluids, “get some rest” is the top prescribed remedy for fighting off sickness. Motivate yourself to go to bed earlier with a cushy sleep mask and/or an aromatherapy ball. If you know a lush sleeping set-up is waiting for you, you’ll be more apt to hustle under those covers! WHY Do You Want to Lose Weight or Get In Shape? Weight. It’s one of the biggest complaints in America. Women across the country openly and privately condemn themselves for their weight, wonder how they gained so much weight, and desperately try to lose weight. It’s an on-going struggle that for some, signifies a very dim light at the end of the tunnel. If you’re trying to lose weight to impress someone, what happens when that person is out of your life? If you’re trying to lose weight to look good in wedding pictures, what happens when the wedding is over? If you’re trying to lose weight to show your doctor that you’re healthy, what happens after that last check-up? The bigger the reason WHY you want to lose weight, the easier it will be to lose weight. The bigger the WHY, the easier the HOW. Similarly, the more EMPOWERED you feel to achieve weight-loss, the more momentum and strength you will have in doing so. 1. 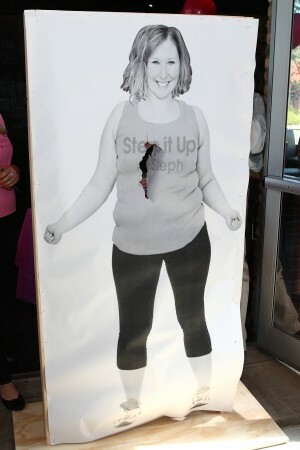 How will you feel when you look at yourself in the mirror after you’ve lost weight? 2. What will you see in the mirror after you’ve lost weight? 3. How will you feel empowered and inspired to make other positive changes in your life once you’ve lost weight? Notice how none of these questions have to do with other people or anything outside of yourself. These questions force you to dig deep to discover WHY you want to lose weight…for yourself. 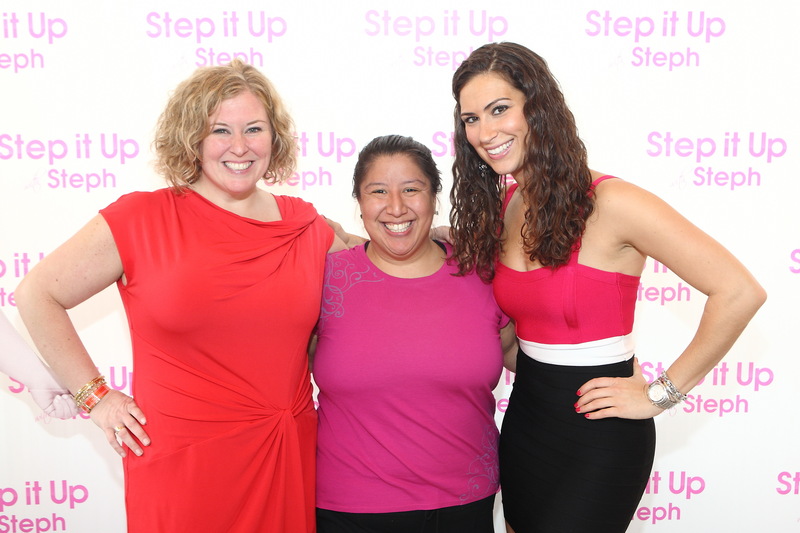 Last week we showed you Marissa’s Wrap Party video and inspiring words from Marissa. This week, we’ve got exclusive footage of Dr. Raby from the Raby Institute for Integrative Medicine at Northwestern and some words from Hope Jelinek-Berry, who did in-home massage and energy work for Marissa. Check it out! 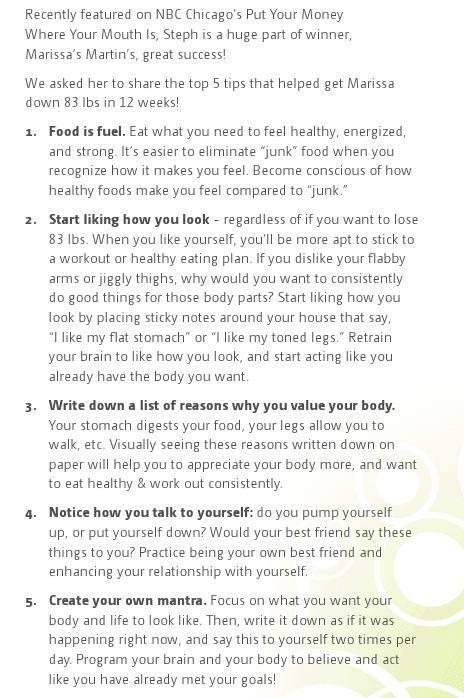 Dr. Raby talks about how to honor yourself as a WHOLE – not just for weight loss or when you’re on a diet plan. And Hope talks about her joys of working with Marissa. We were so fortunate to have The Raby Institute and Hope Jelinek-Berry on our team – thank you!! Hope Jelinek-Berry (middle) helped Marissa Step It Up! Hope shares her journey with Marissa. Dr. Raby showing her support for Marissa. 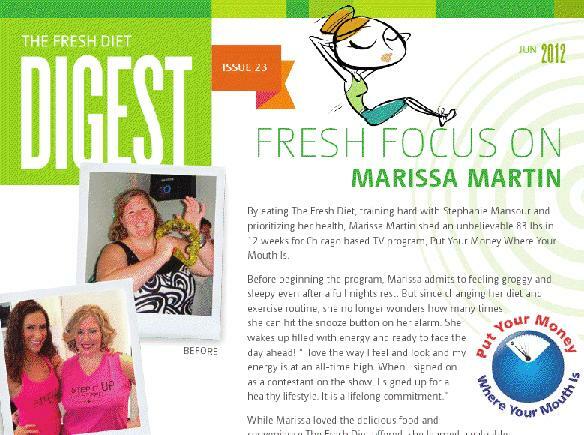 Stay tuned next week, when we hear what people are saying about how Marissa has personally inspired them! Introducing the Step It Up with Steph Team! First, the Raby Institute for Integrative Medicine at Northwestern (on Michigan Ave.) is supporting Marissa via Acupuncture, Naturopathic Medicine, and Health Psychology. The Raby Institute is the premier center for integrative healing seamlessly combining the best of science-based Western medicine with the time-tested, holistic healing approaches of ancient cultures to create a system of health and wellness that honors the whole person.We are SO excited to have them on board because their integrative approach to health and wellness fits exactly with the Step It Up with Steph approach! 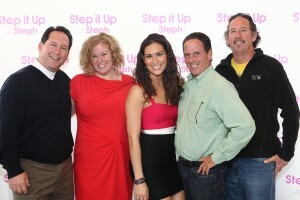 Marissa will be meeting with these practitioners as needed to determine the best line of care for her. Next, our in-home massage therapist, Hope JelinekBerry, is providing weekly massage for Marissa! Along with relaxation and loosened muscles, Marissa will be receiving some energy work and chakra balancing from Hope. Hope is also my personal massage therapist and I couldn’t be happier to have her on board! 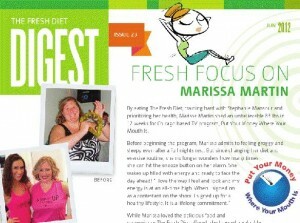 The food for Marissa is sponsored by the Fresh Diet. This company provides nightly delivery of fresh food for the next day. They control the portions, calories, and menu choices, and Marissa gets to sit back and enjoy delicious, gourmet food, and not have to think about anything! 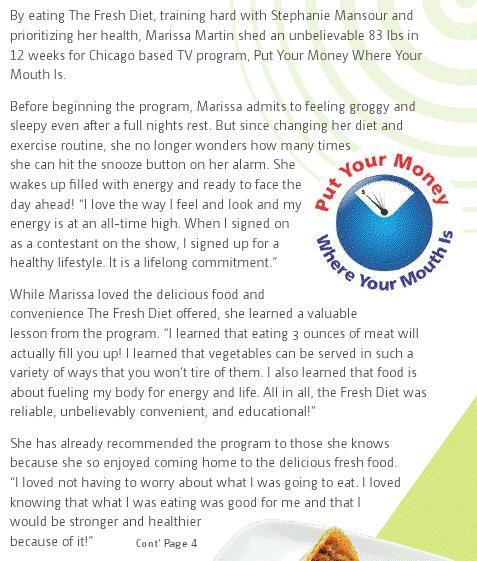 I like this because it takes the guess work out of food and eating for Marissa, and after 12 weeks she will have created a habit for herself to eat smaller portions, more frequently, and eat good healthy food. 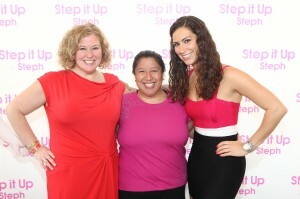 We’ve also got some great Step It Up with Steph yoga mats and blocks donated by YogaAccessories.com! 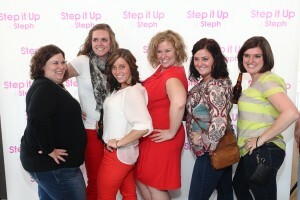 Their products are great! 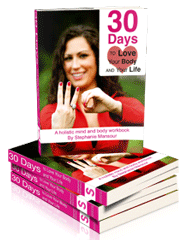 Finally, Marissa’s sticking to a MENTAL commitment of being healthy and fit – she’s using my 30 Day Workbook! Please follow us on Facebook here, and be sure to check out all of our sponsors!